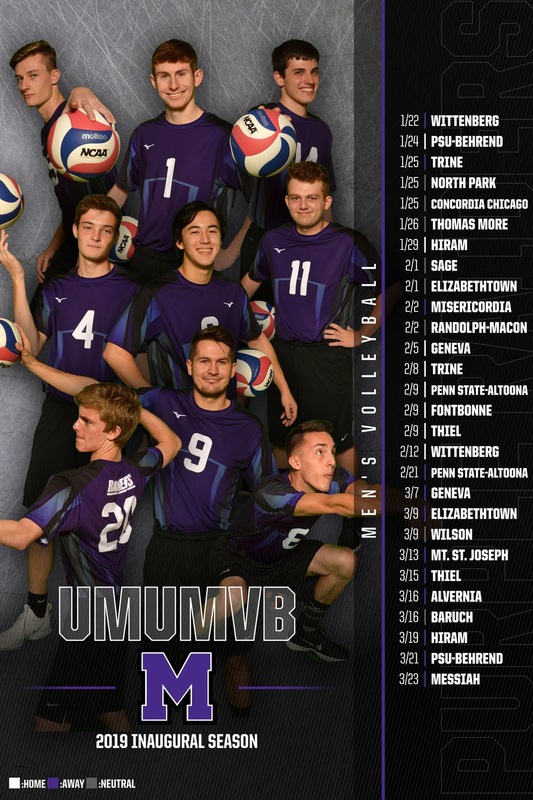 GREENVILLE, Pa. -- It was a pair of sweeps for the Mount Union men's volleyball team on Friday as the Purple Raiders lost 3-0 to Thiel (Pa.) then came back and beat Neumann (Pa.) 3-0 in Greenville, Pa. The split leaves Mount Union at 8-15 overall on the season. In a 25-19, 25-21 and 25-21 loss to Thiel, Mark Bruns (Columbus / Upper Arlington) and Justin Sibbel (Stow / Stow) each had eight kills, Jeremy Leyden (Cuyahoga Falls / Akron Hoban) had 27 assists while he and Steven Grenier (Hawthorn Woods, Ill. / Lake Zurich) each had eight digs. The Raiders beat Neumann by scores of 25-17, 25-14, 25-15 and Sibbel had 12 kills, Leyden had 43 assists and Grenier had 15 digs. Mount Union is back on the court Saturday in Reading, Pa. against Alvernia and Baruch.